To determine the frame depth that you need for your art package add up the components you are using including the depth of the actual art. This will allow you to determine which frames are deep enough to accommodate your artwork package. The rabbet depth is the amount of space in the frame to accommodate the artwork package. 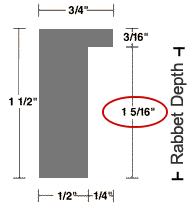 All Metropolitan frames have the rabbet depth dimension illustrated in the product section. Use the frame calculator below to determine the exact depth of the frame you will need and then view our product page to see which frames will accommodate your artwork package. Please select 1/32" 1/16" 3/32" 1/8" 5/32" 3/16" 7/32" 1/4" 9/32" 5/16" 11/32" 3/8" 13/32" 7/16 15/32" 1/2" 17/32" 9/16" 19/32" 5/8" 21/32" 11/16" 23/32" 3/4" 25/32" 13/16" 27/32" 7/8" 29/32" 15/16" 31/32" 1" 1 1/32" 1 1/16" 1 3/32" 1 1/8" 1 5/32" 1 3/16" 1 7/32" 1 1/4" 1 9/32" 1 5/16" 1 11/32" 1 3/8" 1 13/32" 1 7/16 1 15/32" 1 1/2" 1 17/32" 1 9/16" 1 19/32" 1 5/8" 1 21/32" 1 11/16" 1 23/32" 1 3/4" 1 25/32" 1 13/16" 1 27/32" 1 7/8" 1 29/32" 1 15/16" 1 31/32" 2"